When Rome fell to Alaric's army of Visigoths in 410, those citizens who had remained pagans blamed the emperor's rejection of the old gods in favour of Christianity. St Augustine wrote 'The City of God' in response. One of his most widely-read books, it remained important through the Middle Ages because his response went beyond the immediate situation. He wrote of the action of God in the world and in human history. 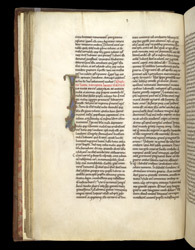 This 12th-century copy of it was made in England and given to Rochester cathedral priory before 1202. Bishops, canons, monks and priests there would have studied it as a theological text, consulted it when writing sermons and read it for enjoyment. Book (Section) III of the City of God begins at the large decorated letter 'I'. Augustine refers to the horrors of invasion and conquest, using as an example the Trojan War (the Trojans were the founders of Rome after the Greeks defeated them). This was of importance to the medieval readers of this manuscript, who marked the part on Troy with short diagonal lines in the right margin. Barely visible, the note "de tro" guides the reader to this point of interest.